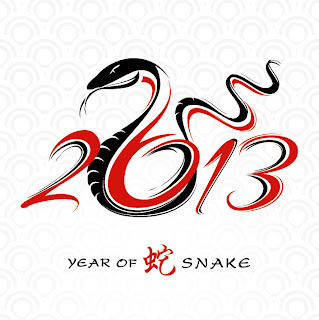 Whether you celebrate Chinese New Year or not, I still wish you all a Happy New Year ("新年快樂") and a prosperous Year of the Snake ("恭喜發財")! Unless you live under a rock (or somehow snowmageddon got you real good), you should all know by now that many of us (a.k.a Chinese peeps) all around the world bid adieu the Year of the Dragon and welcomed the Year of the Snake yesterday. My family is not superstitious at all. We would never go out of our way to not clean (it is considered unlucky to clean on New Year's Day but I'm pretty sure my Dad vacuumed the house yesterday), nor will we purposely not wash our hair (I have to wash my hair every day or I feel gross). As well, for good luck, people should only wear new clothes, and those new clothes cannot be black or white as those colours symbolize bad luck and death (I actually made an effort and wore a traditional red top but it was not new and I wore it with black pants *MEGA FAIL*) Anyway, my point is, we don't follow traditions to the T but what we WILL do every year is feast on a very, very delicious meal prepared by my Mom :) Check out my posts on them --> 2011 Chinese New Year's Eve Feast and 2012 Chinese New Year's Eve Feast. 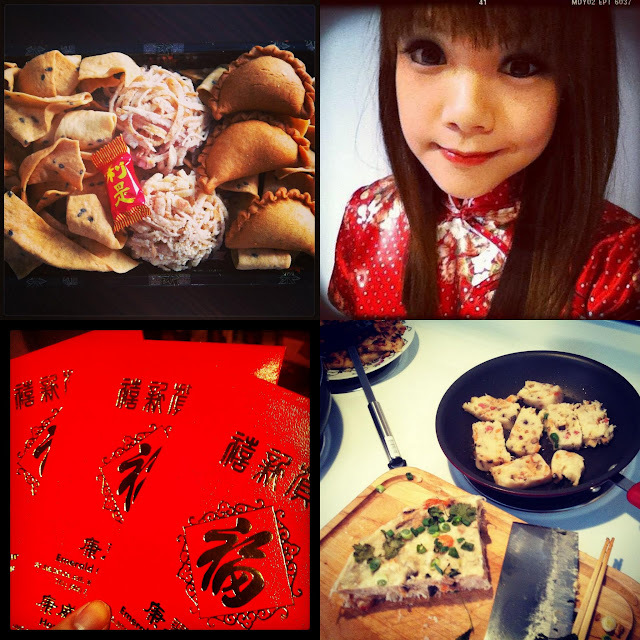 Top left: Store bought Chinese New Year snack box with candies, crackers, taro fritters, and crunchy fried dumplings ("甜角仔") filled with dried coconut and sugar. Bottom right: Pan frying home-made pudding on New Year's Day. This year, aside from making her usual New Year's Eve dinner, my Mom decided to make all the New Year puddings herself (she usually makes the water chestnut pudding only and buys the others). Seriously, this was the best decision EVER! In contrast to the store bought turnip pudding (which consists of mostly flour) my Mom's turnip pudding had tons of turnips, dried shrimps, Chinese sausage and Chinese bacon. Her Chinese New Year cake was also excellent; the store-bought ones are usually insanely sweet, very "artificial" tasting, but my Mom's tasted just right. It also had a very smooth texture. Chinese New Year cake or Nian Gao "年糕"
Sliced into thick pieces and coated with whisked egg, the cakes were pan fried. We ate these tasty cakes for lunch on New Year's Eve and New Year's Day! Ended dinner with glutinous rice dumplings with red bean filling in rice wine soup. My stomach is growling right now as I'm typing this and I'm not even joking. I cannot say this enough: My Mom is the best! Love you!